I haven’t been posting as often these last couple of weeks; life has taken some twists and turns, as it often does. Many gardening/homesteading bloggers drop off a little this time of year, and we understand–we’re all swamped by the harvest and the preserving that usually goes along with its peak. Or at least that’s what it sounds like for those in the East. For me here on the west coast, the peak hasn’t really hit. We’ve been eating some ripe tomatoes everyday, but we’re far from overwhelmed. I’ve been collecting a handful of beans every couple of days, and I pinched off the first of the big-enough zucchinis yesterday. No cucumbers to speak of; the onions and garlic are cleaned and curing. I am picking about a pound of raspberries a day and have been for a couple of weeks. It’s been a lesson in our soil–which has a ways to go–and in the benefits of the diversity in the small garden. It’s been a lousy summer for many crops here, but we’ve still had lots to eat everyday. Which, I remind myself, is the point! So I haven’t been lost in the harvest; instead it’s been life’s transitions taking up my attention. When we moved to this property a year ago, I had a strong sense that life was pulling me in a new direction. I said to friends and family, “It will be so interesting to see where we are in a year or two; this is such a momentous change for us that I’m sure it will ripple through to other parts of our lives.” I said to another friend recently that it’s impossible to make profound changes in many parts of your life without those changes–at some point–catching up with and impacting all of your life. Some of those changes are now unfolding for me. In the meantime, I’ve been reading. I’m a writer and a scholar, and books are my constant companion. I did a PhD in English (Canadian literature) and yet I’ve hardly read a work of fiction in the last couple of years! Instead, perhaps not surprisingly, I’ve been reading non-stop about gardening and food production, and I’ve been hungry for stories about people living with the cycles of their lands. I thought I’d share a few of the ones I’ve finished recently, and I’d love to hear of books that have sustained you too! 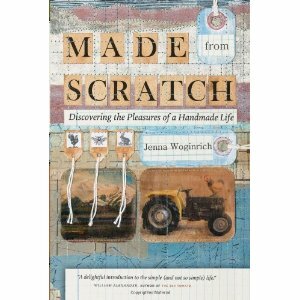 Jenna Woginrich’s sweet book, Made from Scratch: Discovering the Pleasures of a Handmade Life was a quick, pleasant read. The book jacket advertises that this is the story of a young, urban web designer who becomes a homesteader, but that’s not exactly true. Instead, Jenna is passionnate about learning to homestead, but is also happy in her design work. So the book shares her experiences as she learns skills and then puts them into practice in small-scale ways that work for her life at this stage. She works her way through gardening, cooking, rabbits, chickens, sewing her own clothes…all kinds of things. Her coverage of these is fairly basic, though entertaining. But there were a couple of chapters I really appreciated. In one, she encourages readers to learn to play even a simple musical instrument. She argues that music is sustenance when you are homesteading; it is life, joy, community, beauty, and companionship and distraction on lonely nights without tv. She makes a compelling case, and almost made me pick up the viola that I haven’t played in 15? years but that I continue to hold on to! The second chapter I appreciated was one on buying used. Or more specifically, buying vintage. She encourages us to shop at thrift and antique stores both for the alternative pattern of consumption and as a boycott of the contemporary economy, but mostly, she reminds us that when we buy products made before the early 1960s–and preferably long before–we are inheriting objects that were built to NOT be replaced. They are made to last forever and to be repaired easily if they wear out. I will definitely be on the lookout for these! I didn’t learn much from Made from Scratch, but it was sweet and a nice way to spend a few hours. I’m glad I borrowed it from the library, though. By contrast, Jon Jeavons’ How to Grow More Vegetables than You Ever Thought Possible, on Less Land Than You Can Imagine is one that I wasn’t sure I should buy, but now I will. This is the bible of biointensive gardening for North America (or as they refer to it thoughout: GROW BIOINTENSIVE). Jon Jeavons learned from Alan Chadwick, the man who brought French Intensive gardening from Europe and began tweaking it in California in the 1970s. Jeavons was blown away by the transformation of the soil and land that Chadwick was working on, and he has continued the legacy ever since, refining it regularly. The work that the Ecology Action Group has been doing in California ever since stands as one of the longest running food production experiments in North American food culture, and it’s worth paying attention to. It’s a proven, very specific system of food production, but it can also be a little daunting, and it does raise some questions for me. The book’s goal is to teach us how to produce all the food we need plus all the crops we need to improve the soil each year, all on about 4000 sq ft per person, which is much less land than North American food production currently uses per person! Jeavons lays out the whole system to do this, which is great. But what if you don’t have the space or the time to do this? (Jeavons says that when you get experienced, each 100 sq ft bed should only take 15 minutes a day to deal with. A reader in my library copy pencilled in the math–15 mins times 40 beds= 10 hrs per day!) What if you have a little livestock–even a few chickens–that help you improve the soil and provide some substantial calories? What if you have a family of 4? What if your community has waste that needs diverting from the landfill? Or a farm that will produce the grain crops and we can exchange? The book seems to push for us to be individuals responsible for ourselves, rather than on becoming interconnected members of resilient communities, which would be my goal. All that aside, though, there’s tons of good, practical information here, and I’m going to start with some small tips right away–like layering some soil into my compost, to bring in more microorganisms and help to break down the woodier portions of my piles. Well worth reading. 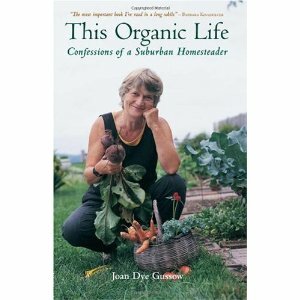 Lastly, I just finished Joan Dye Gussow’s memoir, This Organic Life: Confessions of a Suburban Homesteader. I heard about this one because Michael Pollan and Barbara Kingsolver both cite it as a highly influential and important book. It isn’t what I was expecting; it’s a rather straightforward memoir with just a few sections where she explores some deeper issues of our food system. But she’s a beautiful writer, and the book is very moving. And it’s lovely to spend time in her company. It’s good, too, because Gussow was born in the 1930s, and so has a very different experience of the changes in the food system over the many decades since. I always find it moving to read and/or listen to those who lived in times not so preoccupied with consumerism. It reminds me that it is possible, and that the strange times we live in now are really a blip in human history! The memoir was published in 2001, and most of the analysis that she offers about the food system are a bit self-evident almost 10 years later, but her experiences of growing all of their own produce for many decades is rich, grounding, and inspiring. Also well worth reading. Comes with some recipes too! So what books have inspired you lately? I wonder sometimes about us humans. Well at least us urban and semi-urban ones. There’s a lot of talk in self-sufficiency circles and in the environmental movement about how “we” are completely disconnected from nature generally and from our food production in particular. I’ve been struck again this week by the paradox of animal rights that comes out of that disconnect from time to time. Some animal rights activists, many of whom are also environmentalists, don’t seem to understand that we humans are animal elements of the ecosystems we inhabit, that we do not exist outside of the ecosystem and determine the best course of action for everything else. Though I grew up in the city and never really thought about where my produce came from, I did think about food a lot, and in the early 90s, I became a vegetarian. I was living in the mid-western US, at a residential college. Coming from the west coast of Canada, I had never seen so much meat in my life! Breakfast, lunch, dinner and snacks! Every day! In my second year there, I worked in the cafeteria. All that meat being served came out of the freezer in processed chunks–none of it looked like it came from anything resembling an animal. I didn’t have any difficulty with my choice to avoid all of it. I stayed away from the fish there too (mostly because it only came in the form of “battered fish sticks”, and “battered” always seemed an ominous term), but fish and seafood never entirely left my diet. Since we moved here, though, I’ve been thinking a lot about meat. When the 100-Mile Diet authors started down their path, they wrote about how they had to change their vegan diets to find more local sources of protein and fat. Tofu and olive oil was out, salmon, butter, and eggs were in. I can grow soybeans, garbanzo beans, and oilseed sunflowers, but when I consider the indigenous diet here, fish is king. Fish produced oil for food, but also for lighting and other now-petroleum-based products. Fish is still the staple protein for First Nations communities here, especially the remote ones, and the decline in fish stocks is a profound concern. If I was going to give up a food for ethical reasons today, fish should be it. On the other hand, deer and rabbits are currently in overabundant supply. Deer and rabbits have become de facto protected species in our urban and semi-urban environments–we don’t hunt in the cities (for some good reasons! ); these critters are cute and fluffy and fun to watch; they are no threat to us, so we’ve left them alone. At the same time, we’ve eliminated many of their other predators (wolves, cougars, etc) through deliberate culls or through habitat destruction. Those predators were often threats to us, and we felt justified in getting rid of them. But now the deer and rabbits are overrunning our islands and damaging our ecosystems themselves, as they eat too many of the indigenous plants and destroy the habitats of songbirds and other small but valuable creatures. They also eat farm crops and gardens and are generally pests. The obvious solution to the deer and rabbit problems (and it has been suggested often) is to do a controlled cull and use the meat for food for the local population. Free range and organically raised (well, except for the occasional garden pesticide)! But the outcry is predictable, and soon donations pour in for impractical and expensive sterilization programs or other more “humane” alternatives to killing them. I may be a vegetarian, but I also recognize that humans are predators. We are not at the top of the food chain with some sort of moral responsibility not to consume those below us. We are a *part* of the cyclical, integrated food web. We are food for other predators, or at the very least, for the earth worms and plants when we die. If we try to escape our role as predators in the ecosystem, we are still interfering and disrupting the balance. And even if we don’t eat meat, we still act as the world’s biggest predators when we clear-cut forests to grow soybeans and other large plant crops to feed ourselves something else. Going vegetarian is often cited as one of the biggest impact choices we can make to mitigate climate change. There’s no doubt in my mind that the industrial production of meat is immoral and and an environmental catastrophe. It’s also one of the largest impacts of the North American lifestyle and is completely unsustainable as an export to the rest of the world. The Chinese can not ever eat as much meat as North Americans–there isn’t enough land and water and petroleum for it to be possible. But all those low-impact inhabitants of the developing world? The ones who actually live on less than a planet’s worth of resources every day? They’re not vegetarians. They live in small-scale ecosystems with small food gardens, a few chickens, a goat, maybe a cow. They get eggs and milk regularly, and kill a chicken perhaps every few weeks. On a very special occasion, they kill the goat. Hopefully *after* it’s birthed its replacement! The animal manure feeds the garden, and the meat supplements what would otherwise likely not be a subsistence level of calories. It may not be the most fun life on earth, but it’s kept a balance for tens of thousands of years. 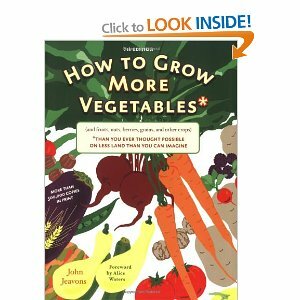 I’ve just finished reading Jon Jeavons’ infamous and influential How to Grow More Vegetables Than You Ever Thought Possible on Less Land than You Can Imagine. It was really interesting, and it will likely become a useful resource for me. But I wondered about its central claim: that it takes 4000 sq ft to grow enough food for one person. That amount of land sustains intensive vegetable and fruit crops, and enough grains and potato-like starches to eat year round. Then it also produces enough compost fodder to replenish the soil in the other beds. It makes sense as a system, but I kept wondering about where the chickens fit in? Surely it would be more land-efficient to not try to *grow* all the calories we need to survive, and instead use some of the waste products of those crops (the kitchen scraps) to grow animals that produce ongoing food supplies (eggs and occasionally meat) as well as manure to help replenish the soil? The nutrient and caloric density of meat surely means we would need fewer of the grain/starch crops that are so land-hungry? I was thinking about all of this as we pulled our crab trap out of the water in the early evening yesterday. The salmon bones and heads went into the bait trap, and a bunch of crab came out. The little ones and females went back, and we kept a big male for dinner. With about 6 big salmon, we have enough fish for the year in the freezer. We’ll freeze a few more crab through the season, and if we’re lucky, add some prawns. If we had a few chickens, we’d have the eggs that right now we buy around the neighborhood. We’ll have enough potatoes and lots of other veg to get through the winter–it’s our first year, so we’ll see how much we need to supplement and for how long. Over the coming years, I hope to be able to grow dry beans and peas for storing too. And maybe some wheat or oats. But surely this is sustainable? It certainly feels low impact. And most importantly, it feels like we are a part of the ecosystem we’re living in. We have a role to play too–not in an abstract, intellectual way that declares that animals should have the same rights as humans, whatever that means. Animals are not different from us, we *are* a species of animal. And we have to consume to live like everything else on earth. But we can also give back and replenish the earth, like every other creature does, and we can respect and help to nurture the lives of the plants and animals that we must consume. So will I stay a vegetarian? I’m not sure. It’s been close to twenty years, and what I crave and how my digestive system has adapted are now part of that decision. And although I have no trouble with the idea of chickens and eggs, I’m not sure I could bring myself to eat the bird I had raised for a couple of years! But the food landscape today is vastly different than it was twenty years ago. And I’m not sure that if I had grown up in the kind of life I’m living now that I would have ever felt the need to give up eating animals to begin with. We’ll see where that takes me. Change is in the air. The shift to fall, the shift in crops all has me in a reflective mood. I’m observing and contemplating things that worked in my veggie plot this year, and what I will do differently next time around. I am thrilled with the fact that this is one of the pleasures of gardening–the chance to constantly do it all over again! 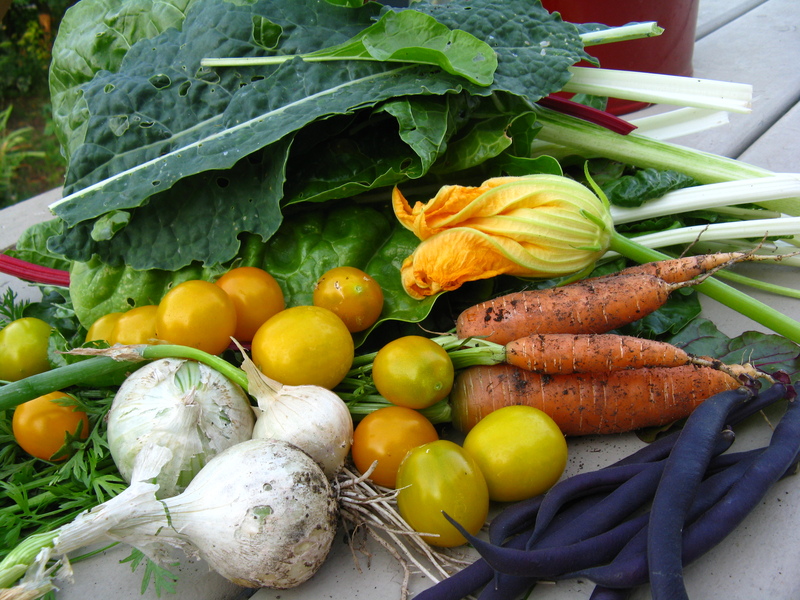 I spent much of the spring wrestling with different food production ideologies: permaculture, organic, traditional local wisdom, the Skipper and other friends and family, and now I’m reading about biointensive gardenning. These systems can all be complimentary, but for a complete novice, their contradictions can be very confusing. And at some point, you just have to stick a seed in the ground and see what happens! And so I have. 1. Tomatoes need their space. It’s always hard when you’re working with seeds and seedlings to picture the true mature size of a plant. My tomatoes are HUGE! I could have easily spaced them 2-3′ apart, instead of the 1.5′ that I did. The Skipper’s bias was clear: closer is better! Pack them in! Now I have the proof to fight back :). 3. Structure is important. I now understand why farmers grow in rows, why people don’t always mix up all their plantings and why they keep various families of plants together. True interplanting/polyculture can get complicated fast. For instance, against one fence, we’ve got hops, sweet peas, nasturtiums, pole beans, berries, and assorted weeds all growing together. Fine for the hops and the rest that don’t need tending, but the pole beans have suffered, and they are a pain for me to get to and check on regularly. The peas were a pain to harvest and were a mess without trellising, even though they were dwarf plants and the seed packets said they didn’t need it. 4. I want more pole beans! I did plant a reasonable number, but not all of them came up. I think I’ve ended up with 2 plants of each of Fortex Filet, Purple Peacock, and Scarlet Runner. They’re not in great soil. They are AMAZING! They taste better than any beans I’ve ever eaten. I want to eat them until I’m sick of them, and there won’t be enough to do that this year. Steve Solomon writes that he only plants a few bush beans, because once the pole beans start producing, the bus beans no longer gets eaten, the poles taste so much better. That’s my new plan too. 5. Keep delicate plants together. I’ve got 5 full beds of tropicals (tomatoes and peppers and cucumbers) at the moment, and assorted extra tomato plants tucked into other beds. I have one cold frame right now that fits over one of those beds. When the night temperatures started dropping fast, I had to choose (I chose a bed of peppers). We’re building some mega beds, and I’ll make sure that at least one has a frame structure that can get some protection easily, and then I’ll plant the veggies that might need it together. 6. Companion planting is a great idea, but hard and confusing to put into practice–particularly in fixed raised beds. Unfortunately, we’re stuck with our raised bed planters in much of the garden–we don’t have any soil in the major kitchen garden section. The hard edges make it tough to tuck flowers in around the edges. I have and will continue to plant the beds with multiple vegetables in chunks, and may try a polyculture bed next year (more on this another day), but I may end up doing what Carolyn Heriot suggested, and just make sure there are a lot of flowers and herbs surrounding the food beds, rather than right in them. This would be easy, because the flower garden is extensive. Overall, our energy right now is to tidy things up, and to start working on easy maintenance, easy access designs in the garden. We’ve figured out what we want to spend our time on, and what is just not going to get attention. We’re dreaming of chickens and ducks (have I mentioned that before?!) and need to think ab0ut our space for sharing. I’m hankering for structure and infrastructure. But one thing we have been blessed with in this slightly messy and overgrown garden is a very healthy, balanced ecosystem. No pests got out of control, and even the slugs were manageable–I suspect thanks to the snakes. We have TONS of snakes, birds, and predatory insects. The last thing I want to do is clean up and regiment so much that we lose that balance. Nature likes a little cosmetic disorder, so there has to be space for that too. Somewhere! What has your garden taught you this year? You know that ad from a few years ago? The one where the woman is walking down the sidewalk on a sunny day, when suddenly she stops, looks down and sees a coloured leaf on the ground in front of her. The camera pans back, and the woman starts screaming hysterically. Well that’s me. I love summer. I love the heat. I love to walk outside first thing in the morning in shorts and a tank top and know that it’s already warm and will only get warmer. I love being able to go out at night without a sweater. And I love summer food. Unfortunately, as warm as it is here, we still live in the “Maritime North West.” As you may know, this means that we have short mild winters, and our spring can start in earnest in February. Which is great in February! But our springs are lllooonnnggg. Summer can feel like it takes forever to get here, and this year we didn’t get the magic “nighttime temperatures consistently above 10 degrees (C)” until early July! Once summer hits, though, it’s awesome. We’ve had six weeks of reasonably consistent close to 30 degree (C) days, and I would be happy with another couple of months of the same. Now that the irrigation is set up and functioning that is. This week, though, I knew it was the beginning of the end. The forecast for Monday was 30, Tuesday was 27, Wednesday 25, today 20, tomorrow 18, Saturday 14 with showers and lows of 11-12! That was my scream you heard echoing through the hills. Yesterday morning I went for a long walk. I opened the back door in a tank top, and promptly went back inside for a proper shirt. I started out down the road, and I knew. It was fall. Isn’t it amazing how you can just know? The air smells different, the angle of the light is different, the wind feels different. I don’t know how things can change so much in a day, but they did. There’s no going back. After lunch, I headed out in to the garden to work for a couple of hours. I pruned, cut down the towering daisies that had flopped over, snipped plants that were getting in the way of the paths. I noticed that some of the roses were reblooming, and that our spectacular trumpet vine was looking gorgeous against the deep purple smoke tree. And I realized that this day–fall and all–was absolutely beautiful. And I remembered that I go through this every year. I fight the end of summer with every bone in my body, and then when it finally arrives–every year, whether I want it to or not 🙂 –I remember that fall is lovely. And then I’m happy until the end of October (when the rains begin). So here’s to fall. Here’s to my tomatoes ripening after all, because everyone else’s do, every year. Here’s to the potatoes and onions and sunshine. Here’s to looking forward to my first brassicas and soups and stews in a long time. And here’s to the best sailing of the year! Every week, I harvest about a pound (I think) of salad greens. A huge head of Red Sails lettuce–it’s been AMAZINGLY tolerant of several heat waves and has yet to bolt or go bitter–some mesclun mix (which bolts regularly, but still has enough interesting peppery leaves to be a tasty addition), some small beet or chard greens that are regrowing after being cut back, and a variety of flavourful flowers like nasturtiums, borage, and calendula. These all get washed and dried and go into an ice cream bucket in the fridge. We go through the bucket over the week in our lunches and dinners. We’ve been enjoying the salads fairly plain, sometimes with a bit of fresh onion or avocado (which we’re unfortunately not growing! 🙂 ). As of last week, though, we have cherry tomatoes to add! Yesterday I finally did collect enough Golden Nugget cherries to bother weighing: 10 oz (just over 1/2 lb). An exciting marker. Yesterday I was also able to collect the first bush beans. Hurray! As I’ve mentioned before, I planted a “tri-colour” blend, but the purple beans have been the only ones to really come to anything. They look and taste great, though, so no complaints. I have purple, green, and scarlet runner beans climbing the fence, so I’m not relying on the bush beans for too long. A few underdeveloped onions, beans, carrots, huge swiss chard (white and red) leaves. And a zucchini blossom! Fried squash blossoms are an unpurchasable delicacy that I have wanted to try for years. I don’t know that I’ll make one with this lovely flower, but I thought I’d pick it to nibble on anyway–delicious and surprisingly juicy! To the other veggies I added some leftover rice, tofu and garlic. I just layer everything in thin slices on top of some hot sesame oil (longer cookers at the bottom), add some leftover rice and tofu, put the lid on and let everything first steam in their own juices, then carmelize a little. Add some tamari to deglaze and keep things from burning, stir, and repeat until you’re happy. I usually add some hot sauce and a little fish sauce, and if I have cilantro and want a Thai twist, I use fish sauce instead of tamari and add fresh lime juice at the end. Top with cashews and enjoy. Yum! The tomatoes we snacked on, and I think we’ll have another big salad for dinner tonight, as one of the lettuce heads looks like it’s about to consider bolting. The jam bucket(s) in the freezer are also filling up nicely; the raspberries are exploding every day! I picked another lb of berries last night too. So that’s my update–what’s been growing well for you this year despite the slightly wonky weather? I have pretty strong political beliefs. And I know that I’m drawn to the idea of homesteading because of my larger worldviews on climate change, global equality issues, and corporate rule of global food systems. But I have never thought about my garden and compost pile as political statements in and of themselves. This weekend, though, I came across Eliot Coleman’s article in Grist Magazine called “Small is Beautiful (And Radical)”, and I’m looking at my compost pile in a whole new way. Coleman is a bit of a cult hero in the world of small organic farming. He’s been at it for around 30 years, and he farms year-round in Maine. He pioneered the North American practice of using simple season extenders like cold frames and row covers, and he does most of his business in the winter, when few others are in the market. He has also been generous and supportive of organic farmers, including newbie ones, writing book after book that reveal techniques to make organic farming on small acreages (less than 5 acres) practical and profitable enough to be a sustainable living. He invents tools for small farmers who don’t need the big mechanized equipment that is sometimes all that is available. He’s an impressive, if sometimes controversial, thinker. This paradigm shift from quantity to quality does seem to me to be pretty radical, and one that strikes me regularly. I think that hoarding is a natural human instinct for survival–one like eating past feeling full that comes out of our reptilian brain–and I think humans do struggle to redefine value as a bargain. This is what McDonald’s recognized with the SuperSize concept–that we will pay a little more to get a lot more even if we don’t want or eat it. We have this drive that takes over because “value” = more for less. Being able to redefine value as quality, and not being distracted by more for less is a radical act, especially in North American consumer culture. But I think this radical shift is one that requires a consciousness that is not desperate for survival, which means it is an especially difficult shift for those struggling with poverty. I think this is where the shift toward organic food is often seen as elitist; it does take a certain level of financial security–or perhaps psychological security–to be able to think about the ethics and quality of food instead of just the price. This is the paragraph that stopped me in my tracks. I knew that gaining food self-sufficiency meant some freedom from consuming, and some protection in case of radical social emergency. But I had never thought about the political freedom that comes from having less to lose if I need to stand up for the causes I believe in. That as long as my land can not be taken away from me, if I can feed myself, I know I can survive indefinitely regardless of what happens in the world around me. In theory, the most powerful position, I think, would be a deep understanding of the natural environment that allows you to eat directly from nature, rather than needing to farm at all. This is why learning about wild foods seems so important to me. But I’m also deeply concerned that climate change is challenging the stability of the wild food supply (we seem to be watching the salmon disappear before our eyes here on the Pacific coast), and that some human production is always going to be necessary. This also demonstrates the political power of land ownership, or perhaps more accurately, the political power of not being displaceable from your land. I’ve thought a lot about the forcible displacement of First Nations peoples, especially in BC, and about how climate change will continue to cause massive population displacement and conflict because of it–as we’ve already seen in the Sudan. But for some reason, I’ve never thought about this as being a direct issue of being able to feed ourselves. Coleman finishes the article by claiming that compost itself is the key to this political freedom. Compost is the magical substance that keeps the soil fertile, and homemade compost is always better than purchased stuff. Compost connects us to the power of the natural world and closes our home and farming food production loop by turning “waste” into “resource”. And did I mention that it’s free? And that anyone can do it (because no one really “does” it; it just happens)? So here’s to the lowly compost pile and the secure food supply that it produces. And here’s to the guerilla gardeners all over the world who are producing food and compost on land they don’t own, and gaining the same freedom and independence from it. And if you really want to see compost that blows your mind, check out Rob at One Straw: Be the Change, who’s not only producing radical compost, he’s using compost radically–including potentially to heat his home’s hot water and to produce methane for harvest. Amazing and inspiring! Meanwhile, back in the garden, we have beets to eat. Beautiful greens with a few reasonable Early Wonder Tall Top beets have been waiting patiently under the ground. Now the Skipper is fickle when it comes to beets. He loves them pickled, he loves the greens, but he’s iffy on the bulbs themselves. I love beets–borscht, roasted, raw grated, juice…I could go on. Back in the spring, I wasn’t planning on planting many beets, though, just some to use for greens. But then, in June when they started to come up so much earlier than other things, Skipper asked me why we hadn’t planted more! So I did! 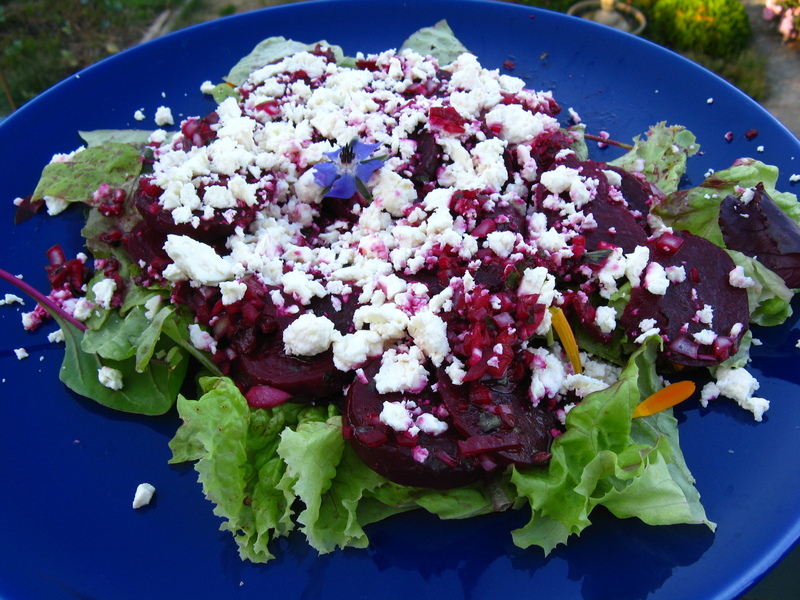 So I went looking for beet recipes, and found this beautiful beet and feta salad. We’ve got lots of feta on hand, so that was a plan. Then I needed a starchy/proteiny thing to eat with the veggies, and I started thinking about the potatoes. And the cream. You can see where I’m going with this. Yep; scalloped potatoes. 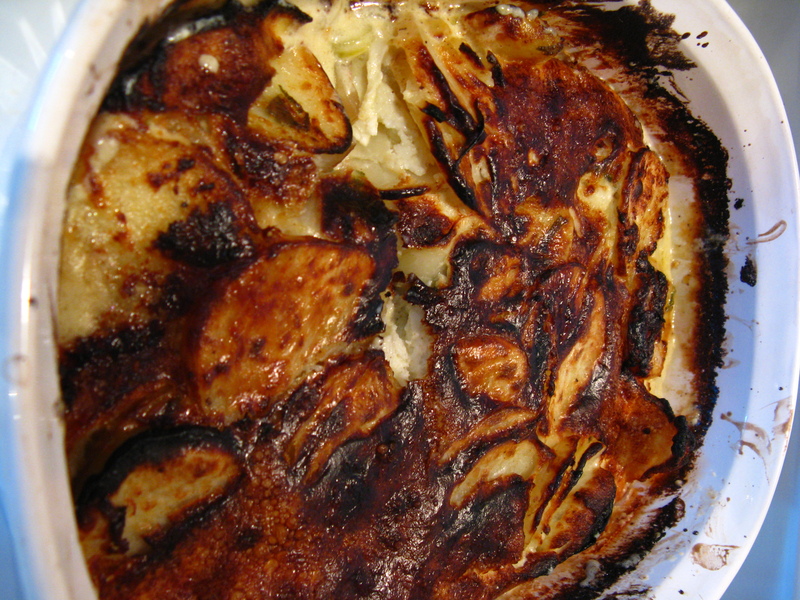 Or as the foodies refer to it: the gratin. I mixed all of this together, and baked at 390 for about about 45 mins, until the potatoes were tender. But then I thought it looked a bit plain, so I followed a tip from a French recipe and mixed an egg with a few more tablespoons of cream, a dash of salt, and some freshly grated Parmesan. That was poured on top, and then the pan went back in the oven for 15 minutes. I’d already turned the oven off before changing my mind, so I just put the broiler back on a few minutes later, so it got a little brown on top. It was rich! (Not a surprise with those ingredients!) But most delicious. And went very well with the salad, which I will definitely make again and highly recommend. I just steamed the beets, rather than roasting them, I added a little more vinegar to the dressing, and served the lukewarm beets over some salad greens. Don’t skimp on the feta, though, as it really does transform the flavour of the beets (as goat cheese probably does too, which is another regular combination). The Skipper gobbled up as much as he could before I grabbed the salad back for my share. Aah..summer.